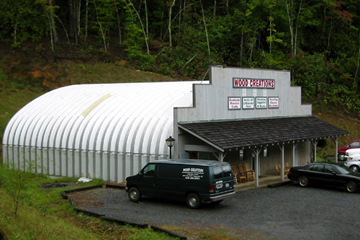 Steel Arch Buildings offers commercial steel metal buildings and standard steel buildings to be used as retail spaces or for adding on to your existing retail space. We know that flexibility and custom design are important to you and your store, which is why we offer multiple customizable options, such as ceiling lights, windows, doors, insulation, and building colors and more. U.S. Buildings’ commercial steel metal building systems and standard steel buildings can save you time and money because they take only a fraction of the time to erect compared to traditional brick, wood, and stone structures. Our units can easily be adapted to fit onto existing structures as well, so expanding your business becomes a much easier task. All of our buildings come with a 35 year steel mill backed warranty so you can relax knowing your building is protected for the next three and a half decades.